Press a thick wooden skewer into the center of each apple and place in freezer for approx. 1 hr. In a small saucepan, combine sugar, corn syrup, and water, bring to a boil over medium heat and cook for approx. 8 – 10 min., or until a candy thermometer reads 150°C/300°F. Once syrup begins to boil, add food coloring and whisk thoroughly. Remove from heat. Dip apples into syrup and set aside. 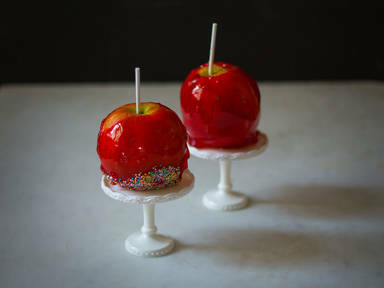 Dip apples into sprinkles, as desired. Transfer to a parchment paper-lined baking sheet and allow to cool. Enjoy!